Cardioverter Defibrillator is a small surgically implanted device (in patients' chests) that gives a patient's heart an electric shock (often called a countershock) to re-establish a normal heartbeat. 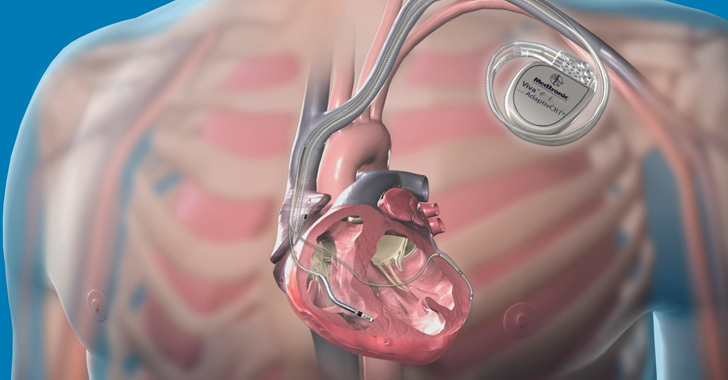 While the device has been designed to prevent sudden death, several implanted cardiac defibrillators made by one of the world's largest medical device companies Medtronic have been found vulnerable to two serious vulnerabilities. > "Successful exploitation of these vulnerabilities may allow an attacker with adjacent short-range access to one of the affected products to interfere with, generate, modify, or intercept the radio frequency (RF) communication of the Medtronic proprietary Conexus telemetry system, potentially impacting product functionality and/or allowing access to transmitted sensitive data," warns the advisory released by DHS. According to an advisory [PDF] published by Medtronic, these flaws affect more than 20 products, 16 of which are implantable defibrillators and rest are the defibrillators' bedside monitors and programmers. > "This communication protocol provides the ability to read and write memory values to affected implanted cardiac devices; therefore, an attacker could exploit this communication protocol to change memory in the implanted cardiac device," the DHS says. The medical technology giant also assures its users that "neither a cyberattack nor patient harm has been observed or associated with these vulnerabilities" to this date. The security fix will soon become available, and in the meantime, Medtronic urged "patients and physicians continue to use these devices as prescribed and intended."